BrightLine Eating Week 1 Free From Sugar – What's for dinner, Doc? BrightLine Eating Experiment, CSA's, Healthy Eating, Healthy Living, What's in the box? How do you feel, Doc? I paid to take the 14 day challenge at BrightLine Eating. I wanted a good start for my sugar and flour free adventure. I am not affiliated with BrightLine and my menus are compliant but not sanctioned by BrightLine. I feel a little fatigued from the low calories. I haven’t workout out all week because it has been really cold in Baja and I exercise in the pool. Burr, 59F in a wet bathing suit, no thanks. Next week I’m hoping to get back to exercising 4 hours a week but I’ll have to modify if my energy is low. Weight loss, fingers crossed, is hard work for the body. I’m thirsty so I’m keeping a water bottle nearby which is a good idea anyway. I’ve been craving an after dinner snack or dessert but I brush and floss my teeth immediately after dinner so snacking isn’t an option. I wake up really hungry and I’m loving my daily oatmeal breakfast. I’m using a mantra against flour and sugar, “I don’t eat that.” It’s early but I think I’m winning the war. 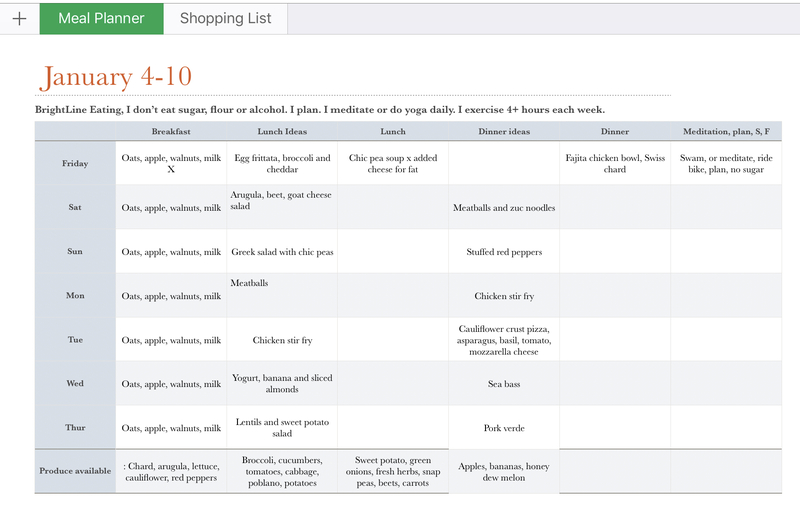 The meal planning is helpful and the guidelines are similar to how I eat now so that isn’t a big deal. The plan is strict which I usually avoid but I thought the structure would make it easier to get off the sugar and if I lose a few pounds that’s a bonus. You eat real food, more vegetables, a little fruit and minimal grains. There is absolutely no sugar or flour of any kind in this diet plan. If it sweetens your food, it isn’t allowed. If it’s ground into flour, it isn’t allowed. I have to say that I am surprised that my sugar cravings are so strong. Dang, the brain loves sugar. That has been the hardest part of this plan but it makes me realize that I need to get sugar out of my diet, precisely because it is so difficult to stop. I don’t want any food “driving the bus”. I’m reading “The Case Against Sugar” by Gray Taubes. It’s very interesting and I’m learning about the history of sugar. Did you know that cigarette companies bathe tobacco in sugar to make it more easy to inhale deeply? Hey, Reynolds, thanks for increasing the addictive potential and health risks of smoking. Don’t even get me started about marketing sugary treats to kids! Coca-cola, General Mills, Kellogg’s, Nestle’s, et al, I’m looking at you. Ugh, it makes me so sad to see obese kids with adult diseases like type 2 diabetes. Loreto, Mexico has an alarmingly high rate of diabetes and obesity. My Menu draft for the week. I write down my meal ideas and then commit to them the night before. I modify the vegetables depending on my mood but the protein and grain portions are committed to in advance to avoid wandering off the plan into high carbohydrates land. Let’s face it, eating more vegetables is never considered a binge. Slow Cooker Salsa Chicken: The easiest slow cooker recipe ever. Dump 8-14 ounces of mild tomato or tomatillo salsa over chicken pieces. You can easily overwhelm your meal if the salsa is too piquante and you can add spicy salsa to your meal after the chicken is cooked. Cook on low heat for 6 hours or high heat for 10 hours. You can also prepare this is an InstaPot in 30 minutes. Shred the chicken for fajitas, salads, lettuce wraps or with more salsa over any combination of vegetables. I like to make enough for a few lunches or another dinner. Sauté chard, spinach, or beet greens with minced garlic, herbs and a little olive oil. Roast a batch of cut up beets, sweet and/ or white potatoes, carrots are serve warm, on salads, with yogurt or eggs. Potatoes are only allowed for breakfast. Make zucchini noodles instead of pastas. Serve with sugar free marinara or lemon, garlic and olive oil. You might like my Low Carb Pinterest Board for more ideas. Onward, I don’t need luck because I have a plan. Stay tuned. Previous Post BrightLine Eating, Getting Sugar Out of My Life, Can I Do It? You continue to inspire, Tracey. We went on a one-week food plan in late Ictober that was an attempt to jumpstart our respective metabolisms into new gear. It was our ONLY week without houseguests or major hosting in a multi-month period. We felt so good on the plan we stayed on it, surprisingly, until Christmas week. So I am writing today to say I have slipped off the NO SUGAR train myself, BUT a ketogenic diet made it truly easy to give up the desserts. Stunningly for me: no cravings, no hunger. (P.S. We are on the road and having an extremely joyful time. Lunching today in the fishing port of Ilwaco where—-confession time—the memory of how they mix Dungeness crab with MY ages-old comfort food (mac and cheese) made me fall off train #2: the no-complex-carbohydrates train. Yet, like I said, YOU inspire. Your latest post flew in at the best time. My slips are short lived in my friendship with you! Thank you for experimenting and researching AND making the effort to post. Crab Mac and Cheese, no apologies necessary. That sounds fabulous. I’m staying on my plan today. I can not say I’ll never eat flour or sugar again. That sounds crazy even to me. Safe travels, amiga. Enjoy the journey.